Giggy Sound is dedicated to projects operated or affiliated with Scott Arnold-Eyers. Launched in 1992 as a record label, Giggy Sound merged with Total Hits in 2010 to support cafe music and now it is back to its former glory in 2015. 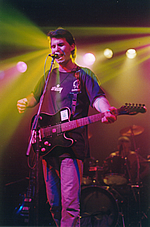 Scott has performed in many bands including The Noise, Hard Marshmellow, Prickle, The Jesus Sandals and a number of solo line ups from the late 80’s to now. A successful music career with more than 10 CD’s under his belt and several national tours, he is now the founder of Giggy Sound and Director of Eyers RockET. Scott has worked in the media since 1985 for various health, entertainment and local publications. He has also dabbled a bit in TV and radio and has considerable Internet experience. Scott has a degree equivalent in Advertising and Marketing from his studies at Adelaide University and The Institute of Advertising. Georgina has been involved with the music industry for many years – singing and playing in bands ever since she left high school. She was also a partner in a music shop and rehearsal room facility in the ’80’s, is still a partner in Bonsai recording studio in Duncraig, and has been working as a booking agent with Leslie Hinton Entertainment since 1995. She completed her Diploma of Events at Central Institute of Technology in 2012. Georgina has been writing reviews for Menu Magazine since its first issue, and is now Editorial Assistant and Office Manager as well as looking after the Total Hits Website.